from countless crypts and forgotten fortresses, undead masterminds scheme all manner of unnatural depravities. Whether they take the form of murderous ghouls preying on a city's poorest citizens, wayward spirits trapped in ghostly form, or nefarious liches who continue their evil beyond death, there's no shortage of terrifying undead in the world of the Pathfinder campaign setting. And now they're just waiting to be set loose on your campaign! Inside you'll find 15 deathless enemies, each with full statistics, details of the villain's history and plots, and a complete lair ready to torment and terrify unprepared heroes. 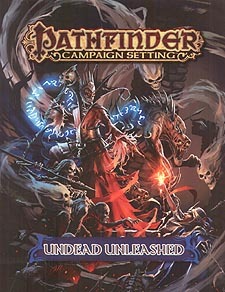 Unleash a host of Golarion's most fearful foes with Pathfinder Campaign Setting: Undead Unleashed! The treacherous ravener Arantaros, who made a bargain with the demon lord of alchemy to extend his life into undeath. The well-intentioned ghost Ordellia Whilwren, who attempts to carry on the work of the goddess of dreams, even in death. The sinister Wight Mother of Isger, blessed by the goddess of undeath herself and tasked with spreading disease throughout the world! Erum-Hel, the mythic Lord of Mohrgs, who plots to put an end to the crusader goddess Iomedae. The Osirian vampire Prince Kasiya, nemesis of Count Varian Jeggare and primary villain in the Pathfinder Tales novel King of Chaos. Ten other foul exemplars of undeath, from ravenous ghouls and devourers to overwhelming nightshades and liches. Pathfinder Campaign Setting: Undead Unleashed is for use with the Pathfinder campaign setting, but can be easily adapted to any fantasy world.